The former Republican senator became an independent in 2007, the year after he lost re-election to the U.S. Senate. He was elected as the nation's only independent governor in 2010. PROVIDENCE, R.I. – Rhode Island Gov. Lincoln Chafee was set to join the Democratic Party – a switch the former Republican-turned-independent has said could boost his chances of winning a second term and one that could set up a primary confrontation with two of the state’s most popular leaders. Fundraising and the support of an organized party likely played a role in the decision too. Chafee said months ago that he was considering switching parties to aid his re-election effort. He has also noted that he shares many views with the party. He was an early supporter of President Barack Obama and spoke at last year’s Democratic National Convention. The governor, a former Republican senator, became a political independent in 2007, the year after he lost re-election to the U.S. Senate. He was elected as the nation’s only independent governor in 2010. His decision complicates next year’s governor’s race, creating the possibility of a primary contest with Providence Mayor Angel Taveras and Treasurer Gina Raimondo. Chafee was coy about his switch Wednesday as he returned to the mainland from a visit with tourism leaders on Block Island. Stepping off the ferry, Chafee wouldn’t discuss his party affiliation but said his beliefs and priorities haven’t changed. “All I’ve cared about since my time in public service started is good, honest, efficient government. That hasn’t changed. Nothing has changed since I was a councilman in Warwick,” Chafee said. Obama said in a statement that he was delighted and thrilled by the decision. He called Chafee an “independent thinker and leader who’s unafraid to reach across party lines to get things done” and said he looked forward to working with him in the years ahead. Many local Democrats declined to immediately weigh in, with some saying they hadn’t been informed of Chafee’s plan. House Speaker Gordon Fox had not been told of Chafee’s plans, a spokesman for Fox said. Hours after news of the switch broke, Fox issued a statement saying he was pleased Chafee had joined Democrats’ ranks. Democratic Senate President Teresa Paiva Weed issued her own statement noting that Chafee has long “embraced many of the ideals” of her party. His potential opponents in the Democratic Party said Chafee’s decision wouldn’t impact their plans. Raimondo said she continues to seriously consider a run for governor. “The governor’s decision to change parties for a second time has not changed my thinking,” she said. 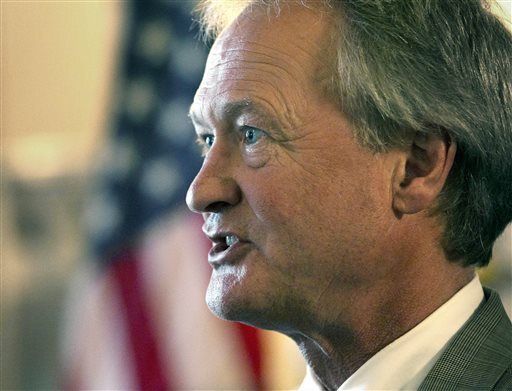 Former longtime Democratic Congressman Patrick Kennedy told The Associated Press that the move makes sense for Chafee given his political views. When asked how he thinks local Democrats will react, given the likelihood that two longtime Democrats are already running for governor, Kennedy, who now lives in New Jersey, said Democrats know Chafee shares their core principles. Registered Democrats outnumber registered Republicans in Rhode Island nearly four to one, although almost half of voters aren’t affiliated with any party. Brown University political science Prof. Wendy Schiller said changing parties is a risky move for the governor, setting up a matchup with two of the state’s most popular politicians with built-in bases of support. Taveras is Hispanic and is likely to compete with Chafee for the support of organized labor. Raimondo could win over more conservative Democrats and tussle with Chafee for the party’s female voters. Although Rhode Island is heavily Democratic, it has not had a Democratic governor for years. Chafee will become the first Democrat to hold the seat since 1995. Following Chafee’s formal party switch Democrats will hold the governorships of 20 states, compared with 30 states with GOP governors. Republican Governors Association Executive Director Phil Cox dismissed Chafee’s move as a calculated act to shore up his re-election chances. Allan Fung, the Republican mayor of Cranston, who is considering a run for governor, declined to discuss the politics of the governor’s move, and predicted a hard-fought Democratic primary. “Most likely it’s going to be a slugfest, and I’m not sure how that’s going to play out,” he said. Chafee is son of the late U.S. Sen. John Chafee, a former governor whose name was synonymous with the Republican Party in Rhode Island for decades. When John Chafee died in office in 1999, Lincoln Chafee was appointed to fill his seat, and then won re-election to the post the following year. In the Senate, he voted to the left of many Democrats, opposing the war in Iraq, for example. But he stuck it out as a Republican through his 2006 re-election campaign, which he lost to Sheldon Whitehouse. He switched parties the following year and made a political comeback in 2010, winning a four-way race for governor with 36 percent of the vote. As governor, Chafee has struggled with poor approval ratings and some of his policy proposals have fizzled in the face of opposition in the Democratic-controlled General Assembly, such as an early plan to expand the sales tax. Chafee is a reluctant fundraiser, and he has often depended on personal wealth to fund his campaigns. He told the AP in December that he was considering joining the Democrats to help his chances of winning a second term.